As a professional services firm ourselves, we understand the challenges you face. Let our experts manage your cash flow, budgeting, payroll costs, retirement plans, and tax strategies, so you can focus on your greatest asset - your clients. 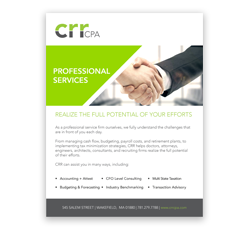 Whether you are a doctor, attorney, engineer, architect, consultant, or recruiter, CRR can help you realize the full potential of your efforts.